It’s quite odd how much a piece of artwork can change from beginning to completion. 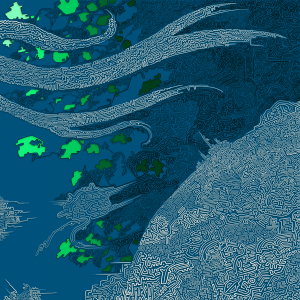 One of the first bits I got started on was the tentacle like shapes, most of which have since been deleted. I named this piece “Abstract Tentacles” and there’s barely any visible tentacle objects left! That’s okay though, I believe the focus still remains to be the wavelike tendrils at the top, so the title still has some meaning. I’m currently working on some other abstract work that I have up on my Patreon page, but it’s currently for subscribers only ($5 or more), but it’s just a preview of what I’ve been working on. It’s there if you’d like to check it out, but it’s not necessary because I’ll be posting it on this website soon. I just need to fill out my Patreon page with as much paid content as possible, seeing as I need to try different techniques to try and acquire new subscribers. It’s not easy! Making money as an artist seems to be the largest hurdle we try to overcome. In a world filled to the brim with creative individuals, it comes down to figuring out what sets you apart from the rest, and doing whatever you can to get yourself noticed. Also, figuring out where your deficiencies lie is something I’m always thinking about. Haha yes, I actually would love to see how this would look printed out in perfect quality in it’s proper dimensions. Also, yes you definitely need to fill your mansion up with my artwork 🙂 Hell, I should make like a set of drawings with the same type of pattern, eh? I think I may do that, even though it’ll take awhile. I see artists doing that all the time.